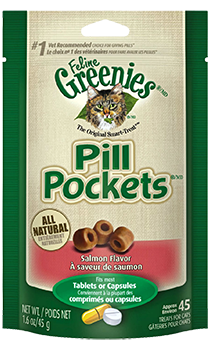 FELINE GREENIES® PILL POCKETS® Treats have built-in pouches to easily hide pills and ensure your cat takes their supplements. These all-natural treats are a healthier alternative to using human foods, because they have fewer calories and less fat and sodium. Plus, they’re made with natural salmon proteins for a great taste. Make pill-giving more enjoyable for both you and your cat. This healthy and delicious treat masks the taste and smell of supplements, making pill-giving a reliable, stress-free experience. These all-natural treats are a healthier alternative to hiding supplements inside human foods. These treats were designed and are recommended by vets to help you follow your own veterinarian’s recommendations and pill-giving regimens. ATTENTION: To prevent transfer of the supplement’s smell and taste, do not touch the PILL POCKETS® Treat with the hand that held the supplement.